ESO, the world’s most productive ground-based observatory, will open its doors to the public on Saturday 22 October 2016 between 11:00 and 18:00 CEST. 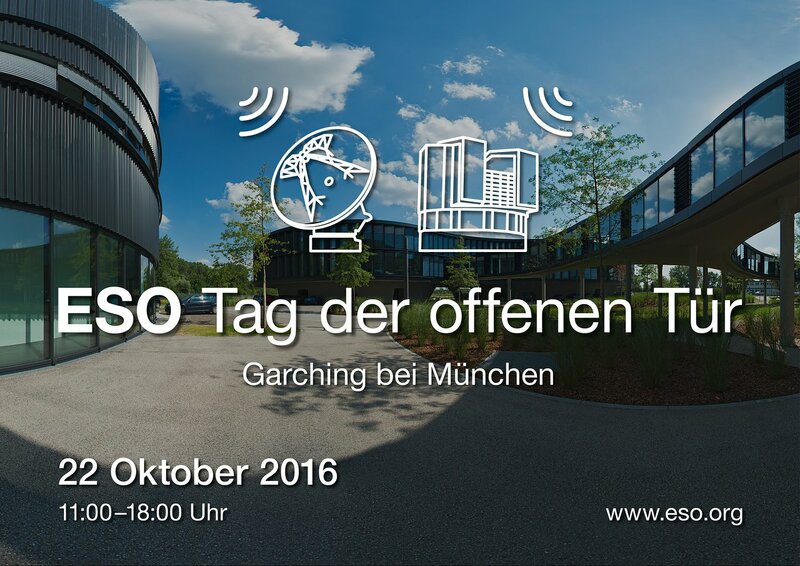 The event will be held at ESO’s Headquarters in Garching, near Munich, Germany. Visitors will have the opportunity to experience the world of ESO first hand by taking part in many different activities. The programme of activities for the day is now available. If you need help to find your way during the Open House Day, look for our members of staff, who are wearing name badges. As ESO is an international organisation, we have staff speaking several languages. 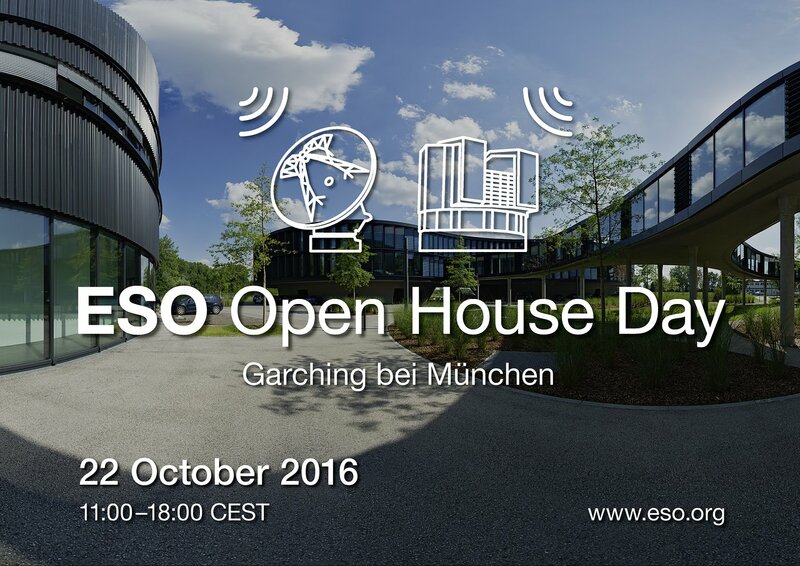 Pick up free material about ESO, an event programme, and a map of the building. Children can pick up passports to collect stamps and get a chance to win gifts if they accumulate all of the stamps from our activities (on departure, gifts can be collected from area 17). Children can also pick up an album for stickers here. Learn more about ESO’s telescopes and science. If you have questions, look for one of our staff members wearing an “Ask an Astronomer” badge. Find out more about this fascinating technique used to compensate for the turbulent atmosphere above us. Take a moment to relax by watching spectacular images and videos from our sites in Chile. Join space rock Pedro and his friends on their exciting adventures. A demonstration of the Stellarium software and other resources, and how you can use them to find your way around the night sky. You can also admire vistas of the starry night. Discover the amazing astronomical objects you can see throughout the year and learn how to identify the bright stars and major constellations next time you’re out stargazing. Visit our integration laboratory and learn about instruments, E-ELT prototype component testing and optical experiments, which optimise the performance of telescopes. Please note: The laboratory is a clean environment and access requires special plastic overshoes that will be provided at the entrance of the assembly hall. If you are looking for souvenirs or gifts, this is the place to visit. If we have clear skies, astronomers will show you the Sun with their small telescopes. Have your infrared picture taken. See how creative, exciting and varied technology is! Give it a try: Come with us on a hands-on tour, with workshops and experiments — or simply ask us questions to your heart’s content! Learn about comets and what they’re made of at this spectacular comet-making demonstration. Children will have lots of fun having their faces painted in all kinds of astronomical motifs such as stars, galaxies or comets.